In Nine to Five, three women accomplish everyone's fantasy�they get to attack and humiliate their boss (although not necessarily by choice). The first half of the movie is a winning office comedy, sort of like an 1980s Office Space. Judy (Fonda) is new at Consolidated, Inc. She isn't the most self-assured (or technologically capable) person in the office, and within hours she has the copier shooting paper all over the floor, earning her a reprimand from the boss, Mr. Hart (Coleman). Office manager Violet (Tomlin) and Hart's secretary Doralee (Parton, in her film debut) explain that Hart's treatment is pretty much par for the course. He has climbed to the top on the backs of his co-workers: if he isn't stealing ideas from Violet, he's trying to have an affair with Doralee. The three fantasize about offing him (in creative dream sequences), but when Violet accidentally mistakes rat poison for sugar and puts some in Hart's coffee, they may find their dreams inadvertently coming true. I really enjoyed the first half of this film. It's funny, if dated, the characters are engaging, and the dialogue is witty and well written. Halfway through, however, the film takes an abrupt turn into black comedy, and the shift isn't a smooth one, to say the least. The three leads are set up as rational, normal characters in the first half of the film, and it is a bit hard to accept all the wacky, unpredictable, and unbelievable things they do by the end of the film. Still, even though it is highly implausible, the latter half of the film is still OK; it's just that the script takes the easy way out, substituting outlandish situations for smart scripting. Any deficiencies in the plot are made up for in the acting. Tomlin, Fonda, and Parton are all wonderful. They have great chemistry, and each shows her own individual strengths. Parton is delightfully innocent, Tomlin is satisfactorily bitter, and Fonda shucks her usual screen presence as she transforms from wide-eyed klutz to loveable criminal. Coleman is good as well, if a bit one-note (but doesn't he have to be?) as the ultimate sexist pig. The final third of the movie does tend to lag quite a bit. I believe if the running time had been shaved by about 20 minutes, much more of the comedy would work�timing is everything, you know. Still, overall Nine to Five works because it is inventive and unpredictable. Director Higgins creatively stages scenes in the bland workplace, and even if the pace slows, the film always looks good. I especially enjoyed the three dream sequences and the various cartoon effects used to envision the murder of Mr. Hart. Though the "glass-ceiling" premise is a bit dated, I'm sure it still applies. There is actually quite a bit of social commentary wrapped up in all the hilarity, but I was too amused to dwell on it. Image Transfer Review: The transfer on this new edition is comparable to the decent presentation on the original 2001 release. Colors look good, with no oversaturation evident. Some of the softness is intentional, especially in the dream sequences, but overall, the film is a bit softer than I would like. Film grain is a bit of a problem, with some areas having quite a lot of it, and others looking good, almost as if several prints were used to make the master. Speaking of the print, it is fairly clean, with only a few small blemishes and some speckles of dirt here and there. Audio Transfer Review: Audio is presented in a stereo mix that sounds a bit dated. Dialogue is clear but slightly flat, and sound effects, while presented with occasional stereo separation, are a bit flat. Still, considering the film's vintage, it's a decent presentation of the original elements. Extras Review: Originally released sans extras in 2001, Nine to Five is being re-issued in honor of its 25th anniversary, which was technically last year, but let's not split hairs. The extras are all newly produced, and should be a treat for fans of the film. 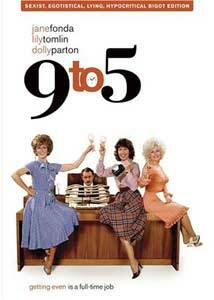 There's a most enjoyable commentary with actors Lily Tomlin, Jane Fonda, and Dolly Parton and producer Bruce Gilbert. The four were recorded together, and spend around two hours reminiscing about the shoot and sharing stories from the set and enjoying each other's company. An easy listen, far better than most dry commentaries. Also worthwhile is the oddly named Nine at 25 featurette (24m:35s) which is billed as "Nine @ 25" on the menus for some reason I don't understand, because I don't have a degree in marketing. It's a well-produced piece that offers a good look at the making of the film, with new interviews with the cast and crew and some vintage on set footage mixed in.Remembering Colin Higgins (04m:41s) is a brief tribute to the late director; the cast and producers all praise him for turning a somewhat troubled project into a comedy classic. Annoyance at the current, idiotic special edition labeling trend aside (come on, the "Sexist, Egotistical, Lying, Hypocritical Bigot Edition," really?) this 25th anniversary re-issue of Nine to Five is worth the double-dip. Audio and video aren't much improved, but the retrospective supplements are all worthwhile.